HadCRUH is a land and marine monthly mean anomaly surface dataset at a 5° latitude x 5° longitude grid-box resolution.It is available in specific humidity (q - g/kg) and relative humidity (RH - %). Note that HadCRUH is not updated beyond 2003. Please see HadISDH for an updated land surface humidity product. A marine surface humidity product is currently under development. The marine data are taken from the International Comprehensive Ocean-Atmosphere Data Set, ICOADS, from 1973 to 1997 and from the NCEP-GTS from 1998 to the present. The marine component of HadCRUH is produced by taking in-situ measurements of T and dewpoint T from ships, marine platforms and drifting buoys, and converting q and RH. Observations undergo quality checks for internal consisitency, spatial consistency and outliers and the remaining values are converted to anomalies by subtracting climatological means based on the period 1974 to 2003. The anomaly values are then averaged over a 5° by 5° monthly mean grid. The land data are taken from the Integrated Surface Dataset (ISD, formerly ISH) provided by the US National Centers for Environmental Information from 1973 to 2003. The land component of HadCRUH is a station based dataset where each station must report sufficiently over 1974 to 2003 to create station climatologies. Simultaneously observed T and dewpoint T are converted to q and RH and put through a series of quality checks for internal consisistency, outliers and humidity specific problems. Spatial comparisons are made with neighbour composites to detect inhomogeneities within each station and timeseries adjusted where necessary. Remaining data are converted to anomalies by subtracting the climatology. The anomaly values are then averaged over a 5° by 5° monthly mean grid. The data are blended where each grid-box value is weighted according to the proportional spatial presence of land or ocean in that grid-box. Boxes containing both land and marine data must have a weighting of at least 25 % for each component. For a detailed description of the dataset and its production process, see the thesis cited below. We recommended you read this before using the data. HadCRUH has been updated as of July 2008 to rectify a small error in the blending process that affects only coastal regions. Differences in timeseries and trends at zonally averaged and grid-box scales are very small and do not change any of the major findings published so far. Please see the version differences page or contact Kate Willett for further information. Decadal trends of surface specific humidity are shown. These have been calculated over the period 1973 to 2003 using a median pairwise technique. Significance is not shown. 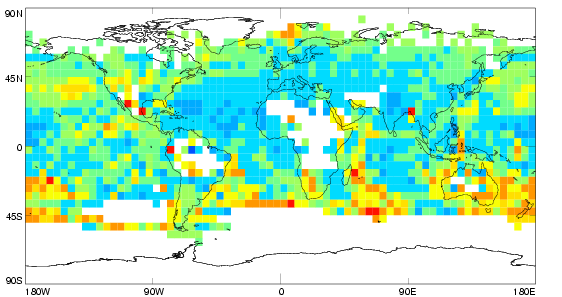 Zonally averaged monthly mean anomaly (relative to a 1974 to 2003 climatology) surface specific humidity for the Globe (70 °N to 70 °S) is shown in red. A 21 point Gaussian Smoothing Filter is shown in blue. The decadal trend is shown over the period of record with ** denoting significance at 1 %. The trend was estimated using the Restricted Maximum Likelihood method. Willett, K.W., P.D. Jones, N.P. Gillett and P. W. Thorne, 2008: Recent changes in surface humidity: development of the HadCRUH dataset. J. Clim..21, 5364:5383. 3.4 Mb. Willett, K.W.,2007: Creation and Analysis of HadCRUH: a New Global Surface Humidity Dataset, PhD Thesis, University of East Anglia, 199pp.